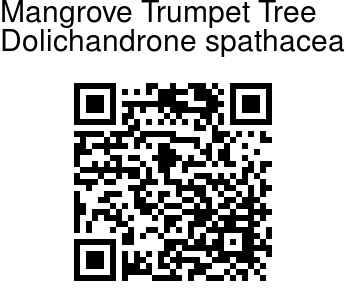 Mangrove Trumpet Tree is a small tree, up to 5 m tall. Compound leaves made up of 2-4 pairs of leaflets eye-shaped (6-20cm long) thin arranged opposite one another. Generally 3 pairs of leaflets with a leaflet at the tip. Young leaves are slightly pinkish and somewhat sticky. At times the tree may be nearly leafless. 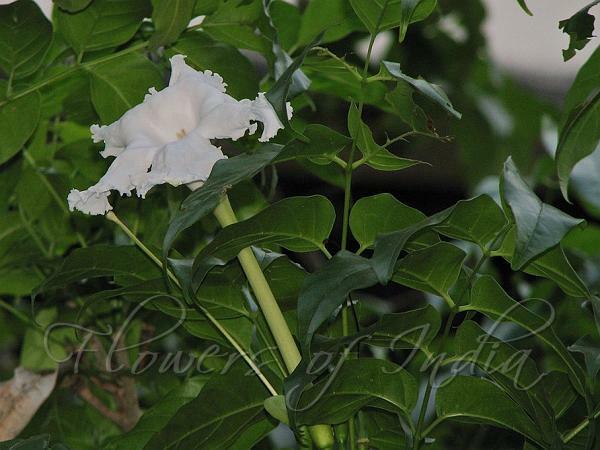 Flowers are trumpet-shaped large, 15-20 cm long, white delicate with ruffled edges, in clusters of 2-10 flowers. The flowers in the cluster bloom one at a time and are very fragrant. Fruit up to 45 cm long, flattened, curved like a bean pod; seeds dark grey, squarish, with thick corky wings. The flower is edible and it is part of Thai cuisine, usually eaten sauteed or in Kaeng som. This species is found in most of Southeast Asia, India and Sri Lanka.